On the premises of the city estate De Kemphaan is the holiday house of the foundation called ‘Kindervakantieland’, kids holiday land. Here children can have their holidays free of worries and make new friendships. While doing lots of nice activities, both on the estate and outside of it. The foundation was started up to offer holidays for kids who otherwise, due to their situation at home, would have no other possibility to go on holiday. The reasons for that can be manifold, such as financial or physical problems. During the holiday weeks, the team of the foundation does various activities with the kids. Sports and games, for instance, hiking tours or scavenger hunts, on the premises of De Kemphaan. In the same week they also make an excursion outside of the estate. Then they go, for example, to the animal park at Amersfoort or to Nemo at Amsterdam. Most important thing is that the kids have fun and get a real holiday feeling, too. Much attention is given to equal treatment of all kids. No one is preferred over the others and no one gets excluded from the group. The holiday home is specifically prepared for hosting bigger groups of children. There are ten bedrooms, each of them equipped with three bunk beds. So enough kids can stay here and have some fine holidays at the kids holiday land. There same building also features a living and eating room, a modern, well-equipped kitchen and enough space for some sports and game activities, both inside and outside. And various sanitary facilities are inside the same building, too (including a toilet for the disabled). Furthermore, there is entertainment equipment among which a piano, a radio, a DVD player, a TV, a computer and various games. The foundation has specifically been set up to organise holidays for kids. Main intention at the kids holiday land is to give kids the chance to spend fine holidays together with other kids. The foundation exclusively works with volunteers who take care of the kids during the holiday weeks. Each year enough volunteers must be found so that those holiday weeks can be realised. Thanks to the enthusiastic and strong volunteer commitment, all kids have great holidays here. Would you like to support us? Let us know, send us an e-mail! Are you looking for a beautiful place where you can organise a family gathering, a training with your colleagues or a fine excursion with your school? In that case, this holiday home is the perfect place for you – just except during summer months. 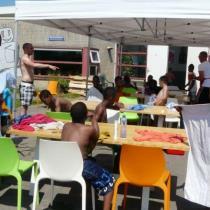 During the summer holidays the house will be used by the Kindervakantieland foundation. But before and after that, it is available and can be rented by different groups, for a variety of activities. Get in touch with the foundation for more information. The surroundings of the city estate De Kemphaan are perfect for bigger groups of kids: The city estate offers many activities where also the kids staying with the kids holiday land foundation can fully participate in. There are, for example, several playgrounds, a pancake house, the ape islands of the AAP foundation – and of course the extensive, wonderful forest where they can play and do games, as many as they want. 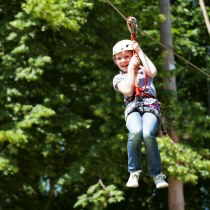 There also is a camping site nearby – and the climbing forest Fun Forest. All these facilities can be found on the same premises of the city estate De Kemphaan. The foundation Kindervakantieland was registered in 1986 by Henk van Slooten. 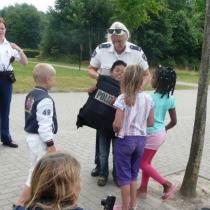 The municipality of Almere gave Henk van Slooten the opportunity to open a space for kids. And this was a dream Henk had nurtured since a longer time already. It meant that he could do what he always wanted to do: Concentrate on working with youngsters. His foundation was started up to offer holidays for kids who otherwise would have no other possibility to go on holiday. And the result is what you see today on the city estate De Kemphaan!